Scia Engineer 2013 introduces a new tool for preparation of the project documentation - ‘Engineering Report’. The Engineering Report is an external application where the output can be displayed. This application not only offers a nice layout, but also has the advantage that a document can be assembled easily and quickly. 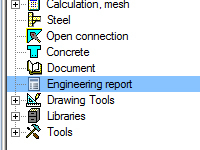 A useful feature in the Engineering Report is the formatted text. In the original Scia Engineer document only a text line could be entered, without any formatting. In the properties the choice can be made to align the text left, right or centered. In ‘edit text’ there are several options available to change the format. This editing allows for changing the font, color and style. Moreover, it is also possible to define all kinds of symbols. Greek letters and mathematical characters can be displayed by using the following syntax: "&symbol;"
More information about the Engineering Report? In Scia Engineer 2013 you will find a manual about the Engineering Report by going to ‘Help’ > ‘Contents’ > ‘Other’ > ‘Engineering Report’. We recommend you also to visit elearning.nemetschek-scia.com > ‘Scia Engineer course’ > ‘Engineering Report’.